The [email protected] Complete ID Card Kit includes everything you need to create professional, durable, PVC card quality ID cards from your office or home using any inkjet or laser printer! PRINT: Print directly onto our 8-up ID card perforated Teslin® synthetic sheets using any desktop printer! Design your ID cards using the free IDCreator.com ID card templates, your own software, or even Microsoft Word and Adobe Photoshop! PUNCH: Punch out the ID insert from the Teslin®sheet and insert them into the seamless butterfly pouches. We also carry butterfly pouches with magnetic stripes for your access control needs! LAMINATE: Place the card directly into the EasyIDea™ MiniLam™ 450 series ID card Pouch Laminator included in your Complete ID Card Kit. In seconds, you will have durable, waterproof, borderless ID cards that look and feel like professionally printed PVC cards! ArcadiaID recommends using the EasyIDea™ MiniLam™ 450 series when laminating ID Cards but if you wish to use a different laminator please make sure to set the temperature to 270F and place your ID Card in a carrier. - ID Holograms or Protective Overlays. 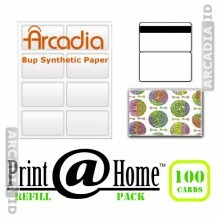 The larger [email protected] ID Card Refill Packs are more cost effective for each ID card created. Teslin®ID cards and Artisyn® ID cards look and feel just like professionally printed ID cards!